If you didn’t know better, you’d think that this is a beautiful picture of model buildings assembled from a modelling kit, but this is Ålesund , Norway’s Art Nouveau town. In January 1904 a devastating fire raged through Ålesund , burning down 850 homes and leaving 10,000 people homeless. Only 20 percent of the houses in the town centre survived the fire. Through a tremendous effort by the local population and other helpers, Ålesund was totally rebuilt in 1907. The young Norwegian architects who designed the houses were influenced by the art nouveau style that was popular at the time. Thanks to these brilliant architects, Ålesund today is renowned both nationally and internationally for its architecture, and join cities like Glasgow, Barcelona and Vienna as members of “Rèseau Art Nouveau Network”, a European network of Art Nouveau cities. All around town buildings are decorated with towers, turrets and imaginative, colourful ornaments and tiny details that make these houses so beautiful. Walk along Kongensgate, the pedestrian street and you’ll be able to see the engraved facade of the houses. A birds-eye view of the town can be seen from Mount Aksla. You can get there by taxi but Tony walked up the 418 steps and was rewarded with some really stunning shots. Ålesund Museum tells of the town’s history and at Sunnmore Museum there’s a unique collection of boats and restored houses displaying ancient building techniques, as well as archaeological finds from the Middle Ages. 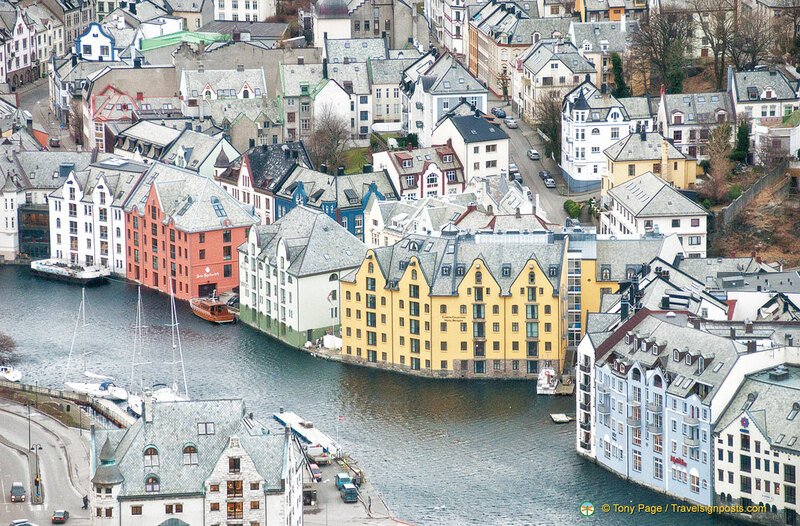 Ålesund, with its 35,000 inhabitants, has one of Norway’s largest fishing harbours.